It’s finally happening! NieR Automata is just around the corner. This is a game I never expected would exist. The first NieR was a critical and commercial failure. It deserved to be neither - indeed, we’ve formally classified it as the best game of all time at DDNet - but none of the fans of the original held any hope for a sequel after the developer, Cavia, shut up shop. 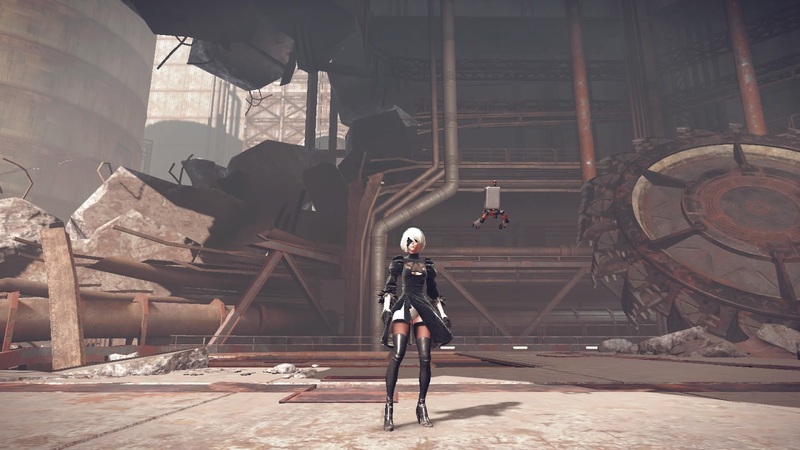 And then, at the 2015 E3, Square Enix announced something that blew fans away; NieR: Automata was happening, and the key artists from the original NieR were all back, including series director Yoko Taro. Only this time, the vision of those artists is backed by a brilliant development studio in PlatinumGames. And now… now I’ve played it. The question was always going to be whether the sequel could possibly hold up against the quality of the original. It’s a little difficult to hold up to my favourite game of all time, after all. 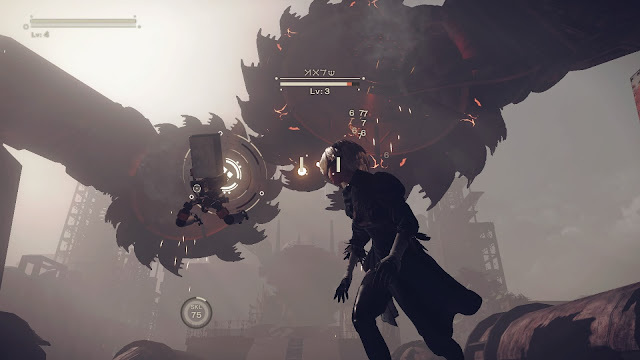 The demo that I’ve been able to play (which should be available for everyone by the time you’re reading this) takes place across the first 30 minutes or so of the game, and while it ends on an absolute cliffhanger, and is not nearly enough to get a sense for what the game’s really about, I say this with absolute confidence: NieR: Automata is every bit the sequel to NieR that fans have been hoping against hope for. Through the demo you take control of a young woman, who we quickly learn is much more than what she first appears to be (but no spoilers because I want you to experience this for yourself). She’s in a decrepit factory, fighting off waves of robot monsters that look eerily like a certain character from the previous NieR, before taking on some absolute giants as bosses. She also has a little floating robot companion who assists her by shooting bullets for a ranged attack. We only get the vaguest of ideas why she’s there. We know that the side she’s fighting on has a hatred for robots, but there’s not much more than that. We get the sense that the robots have destroyed life in some way, or there was at least an apocalypse, as the woman is surprised that life has “come back” to the factory, with some birds settled into the abandoned machines. We also get the sense that robots are much more than mindless enemies, with the woman again surprised when some of them display intelligence. Then, at the cliffhanger, the woman apparently dies, so we have absolutely no idea where the narrative is going to go from there. Though the opening chapter of the game is action-packed and narrative-thin (and we know it’s the opening act, as the woman is at level 1), we nonetheless get an immediate sense that this is going to have an intriguing world, and Yoko Taro has never let us down with narrative. Indeed, Yoko’s games are always philosophically dense and quite intense. Thin as the explicit storytelling might be, there’s enough ambient narrative design to know that PlatinumGames has in no way compromised Yoko’s ability to weave complex narrative into the action. 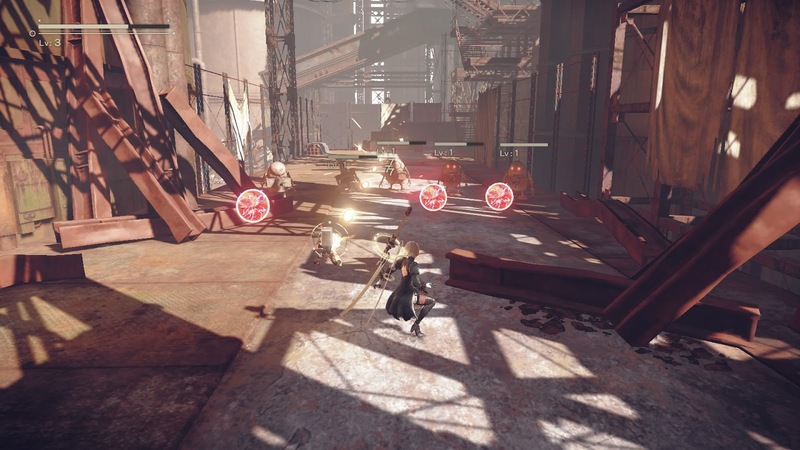 NieR was notable in part because it would constantly shift between different “genres” of gameplay. One moment you’d be playing a standard open world JRPG, but then you’d shift into a bullet hell sequence, a 2D platformer section, and even a visual novel sequence. Then you’d head back to your home town and indulge in a spot of Harvest Moon-style farming. NieR: Automata is following through in this vein. 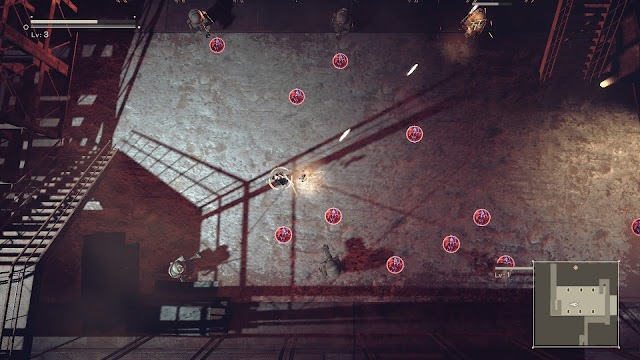 Within the short period of the demo there is 3D action RPG gameplay, as well as 2D platformer and top-down dual stick shooter sequences. The transitions between these disparate gameplay types is much smoother and more dynamic this time around, and the action itself is so incredibly slick. This is PlatinumGames at work. The game doesn’t feel like Bayonetta or any of Platinum’s other games; one suspects that Yoko is one of those kinds of auteurs who will not compromise on his vision for any development studio he’s working with. Comparing this game demo with Drakengard 3, which was similarly linear in structure, really shows the benefit for Yoko to have a supremely competent team backing him up. Intriguingly, in the difficulty settings, the highest difficulty has a rule where a single hit will kill the character. 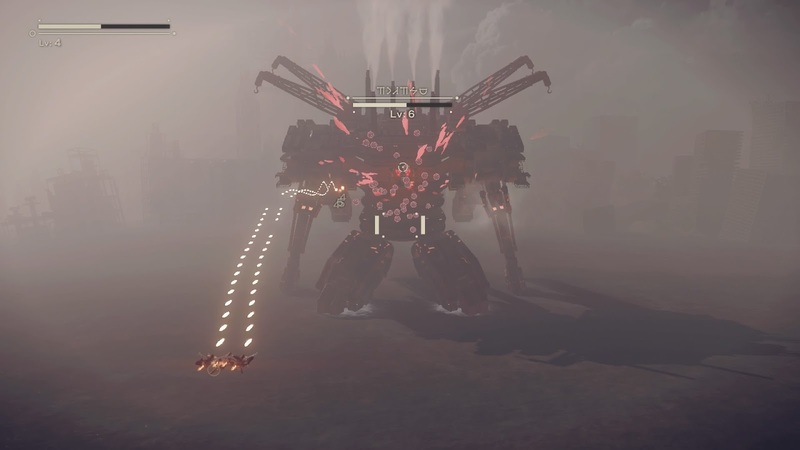 On lower difficulty settings you’ll be able to use healing potions and the like, as with a normal JRPG; but that higher difficulty setting introduces a bullet-hell-like environment, where enemy projectiles are filling the screen, and ducking and weaving around them is a big part of the experience. It’s also a good indication of how smooth and responsive a combat system this game has; there’s no way a “one hit death” rule could possibly be playable if the character didn’t control like an extension of your will, which she does. 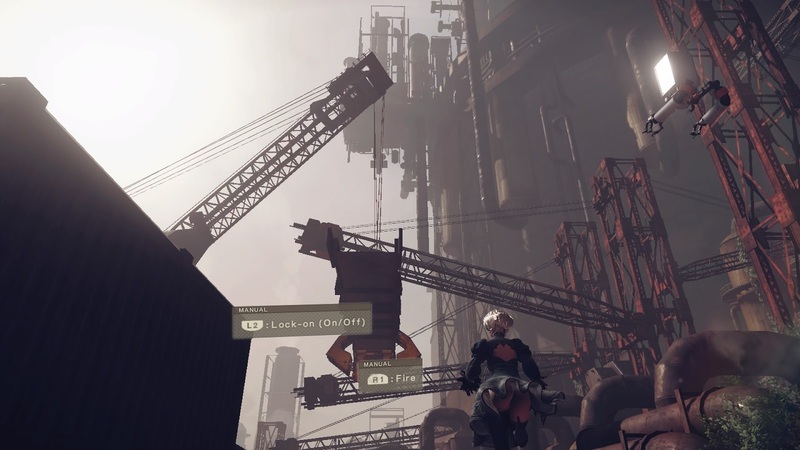 There are still so many questions left after playing the NieR: Automata demo. It’s a gorgeous game, in the sense that industrial art is beautiful, but we don’t get much more than a tantalising hint at what might lie ahead in the real game. But based on what we have here, I am confident that this game will be as intelligent and complex as its predecessor, as well as the Drakengard games, while also being a far more refined gameplay experience than what we’ve seen from the teams that Yoko Taro has worked with in the past. In short, I’m 100 per cent certain that this is going to be my favourite game of 2017, if not forever.